The included study material consists of a comprehensive online practice exam designed to help you quickly and easily learn all required material for Endorsement H, the hazardous materials endorsement. The hazardous materials endorsement allows drivers to transport materials classified as hazardous. The hazardous materials endorsement works to ensure drivers carrying hazardous materials understand their own role and responsibilities when hauling hazardous materials. Drivers must have a CDL with a hazardous materials endorsement before driving vehicles carrying hazardous materials which require placards. Drivers must pass a written test about the regulations and requirements to get this endorsement. 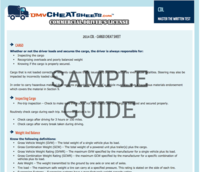 The study material in this section is designed to help drivers review the material and ensure they are prepared to take the hazardous materials written test.